She'll be chic, simple, and cool in this Moschino Kids® Logo Heart Graphic Set. Jewel neck tee. Ruffle, cap sleeves. Branded heart graphic at left chest. Back snap closure. Straight hemline. Matching pants with elastic waist. Branded print throughout Side hand pockets. 95% cotton, 5% elastane. Machine wash cold, tumble dry low. Imported. This item may ship with an attached security tag. Merchandise returned without the original security tag attached or a damaged tag may not qualify for a refund. Measurements: Length: 12 in Waist Measurement: 16 in Outseam: 7 in Inseam: 2 in Front Rise: 6 in Back Rise: 8 in Leg Opening: 12 in Product measurements were taken using size 12-18 Months. Please note that measurements may vary by size. 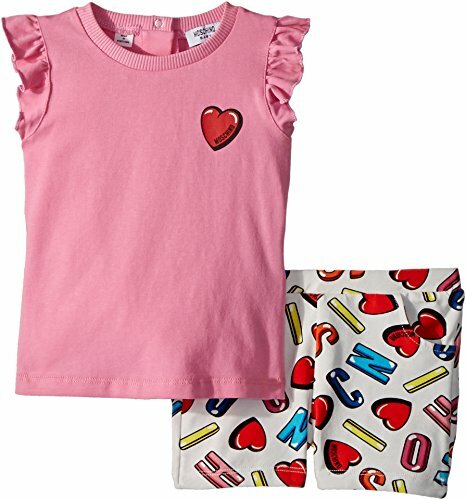 She'll be chic, simple, and cool in this Moschino Kids® Logo Heart Graphic Set. Branded heart graphic at left chest.